When it comes to interior painting, exterior painting, commercial painting, and residential painting, you have made the right choice by choosing Springs Painting Co. We are family owned and operated. 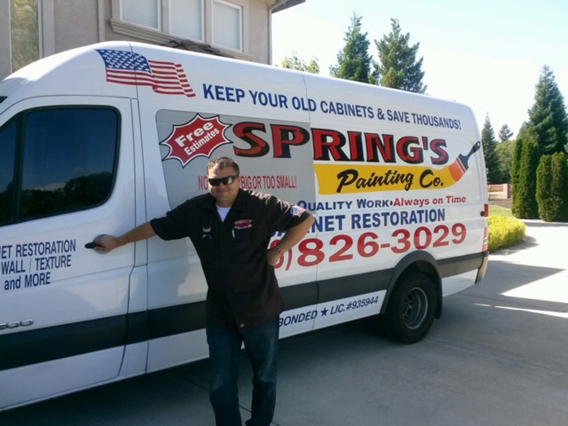 The owner, Joseph Ciuriuc has over 30 years of paint experience and is involved with every job every step of the way. CSLB license # 935944. Call a local reputable company, Springs Painting Co, to make sure that the first impression of the interior or exterior of your business property is clean, professional, and up-to-date. Each of our employees is trained in all the necessary skills to give you the highest quality finished product. We can work with your schedule as to not disrupt your daily flow of business. Need help with Paint Colors? We can do that for you! Our color coordinator is available upon request and has over 10 years of experience with decorating trends. We strive to meet our customer's needs. We always offer friendly, prompt service with jobs completed on time and on budget. Technological advances have allowed for the creation of low and No VOC paints that emit fewer (or none) volatile organic compounds or abrasive odor into the air. You do not get 5 star reviews by putting out low grade work. We take pride in our work and our reviews show. We take the “Pain” out of painting. Your satisfaction is our guarantee.